I have a talk with the Cleaning Lady, and we say our goodbyes, and the whole thing is surprisingly easier than I thought it would be; it probably doesn’t hurt that I feel so bad about it that I cry as I tell her I simply can’t afford her services anymore. The Child pitches in, as she had promised she would, and helps out with the vacuuming, and sometimes surprises me by making my bed for me or cleaning my bathroom. I do the same for her, and the whole thing is off to a good start, and she wants to talk about vacations. She remembers our trip to Belize, and thinks how nice it would be to go back, but without The Departed. It would, I agree, but it’s not in the cards. I show her the cruise I am thinking about, on a ship that leaves from Seattle (no additional airfare), everything included in the price (so I don’t have to spend the trip worrying about money). She looks at the video tour of the cruise ship, mesmerized by the size of it and all the buffets it has (she can eat what she wants and lots of it). She keeps helping out around the house, and though I don’t love how she loads the dishwasher, I do love that she’s not only willing to do it, but loads it better than the Cleaning Lady, and in far less time than The Departed, so that even when we procrastinate a bit about cleanup, it’s not an insurmountable obstacle to having dinner at a reasonable hour. It was on such a night that I made this soup: The Child cleaned the kitchen and loaded the dishwasher while I walked the Red Dog, and when I came home, I simply cooked in my clean-ish kitchen. I forget where I found this recipe, originally from the Saltie cookbook, but I had been waiting to try it. The Child likes both cauliflower and gruyere cheese, so I figured I had a winner on my hands. The soup was very easy to make, and I made only two adjustments to the recipe: I omitted the cup of fresh parsley it called for, both because it seemed like too much parsley and also because I forgot to buy any; I also used packaged vegetable broth instead of chicken broth, since The Child theoretically might eat it. The soup turned out more brothy than I expected – I somehow thought that it would be a thicker, cheesier affair, at the end – but I didn’t mind. The cheese added a lot of flavor to the broth, and the final result was filling and oh so delicious. The Child was more mixed in her praise, which is a roundabout way of saying that she couldn’t decide if she liked it or not. She thought oyster crackers might help. I thought it was perfect just as is. Prep the cauliflower: Remove the outer leaves, cut into large florets, and break apart into small florets with your hands or a knife. In a soup pot over medium-high heat, melt the butter in the olive oil. When the butter begins to sizzle, add the leeks and a pinch of salt. Sauté the leeks until they begin to wilt, about 5 minutes. Add the cauliflower and another pinch of salt, and cook the cauliflower and leeks until they start to come together, about 3 minutes longer. Add the gruyere, and give everything a good stir. Add just enough stock to cover the vegetables. 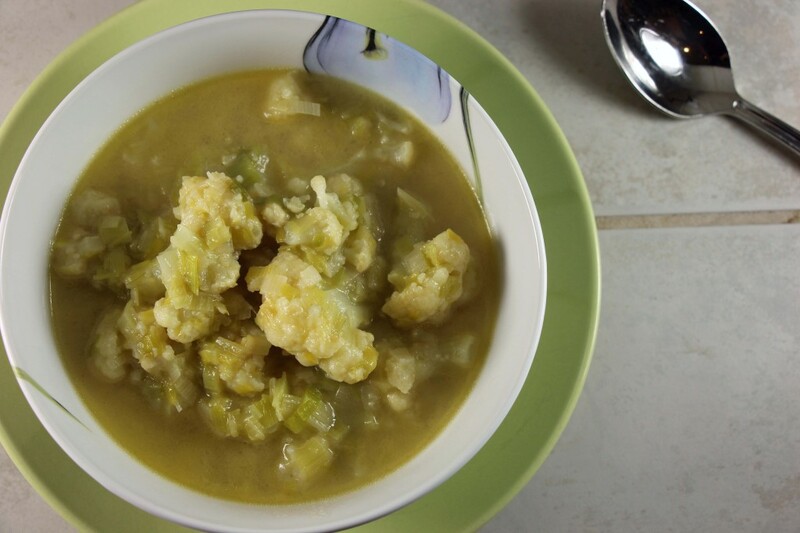 Turn the heat down to low, and simmer until the cauliflower is tender, 20 to 30 minutes. At this point, the cheese will have mostly melted. Taste and adjust the seasoning and serve hot. The original recipe calls for chicken broth, but I substituted vegetable broth. The original recipe also calls for the addition of one cup of fresh parsley at the end of the cooking, which I omitted. Thanksgiving arrives, and for the first time in a decade, I am not the host: My annual guest declines, I guess you’d call it. After years of simply assuming we both had plans and rotating Thanksgiving and Christmas between our houses, she is heading out of town this year, which she remembers to tell me only when I email to confirm our usual arrangement. I am glad she remembered at all, and kind of relieved: This year, there will be no child-proofing of my home, no week of cooking followed by a week of cleaning up. Nothing to do, in fact, except accept another invitation and ask if I can bring something. Sure, anything I liked. I order a turkey-shaped challah bread from my local bagel shop, to be picked up on Thanksgiving morning. I wake up early that morning, and wander around the house for two hours, waiting for the bagel place to be open so I can pick up the bread. The errand takes all of 20 minutes, including time to get gas. I still have seven hours to fill, and no idea what to do with them. I decide the bread isn’t enough, although it will probably win a prize for kitschiest contribution. So, I make a pan of roast leeks, too, settling on the recipe after an absurdly long search for something that is unique and yet will complement hyper-traditional Thanksgiving fare. I chose the recipe below because it has the added positive that it can be prepared ahead of time and served at room temperature, eliminating any possibility I would have to annoy the hostess by being underfoot at some critical time. They didn’t take very long, or require much attention, and it’s fun and relaxing to have a morning to myself to do cook whatever I wanted, rather than what everyone else expects. As I cook, I reflect on the way some of my old friends seem to be falling by the wayside: The two ladies from the jewelry party, my annual holiday guest, but even before that, a long-time friend I tried to meet for lunch on a summertime business trip who rather oddly never got back to me, and whose Christmas card would normally be the first in my box each year, but which instead hasn’t arrived at all this year. I wonder if I should feel bad, but the truth is, I don’t: I’m busy making other plans with other people, too. This is a great take-along dish for the holidays: Different enough that no one else is likely to bring the same thing, with a pure, simple flavor that goes well with a lot of dishes. You can make it ahead of time and serve at room temperature. Position a rack in the center of the oven and heat the oven to 375°F. Arrange the leek halves cut side down in a snug single layer in a shallow baking dish. Nestle the thyme sprigs among the leeks. In a small bowl, mix the olive oil, wine, and 1 Tbs. water and drizzle over the leeks. Sprinkle evenly with ½ tsp. salt. Cover the baking dish tightly with aluminum foil. 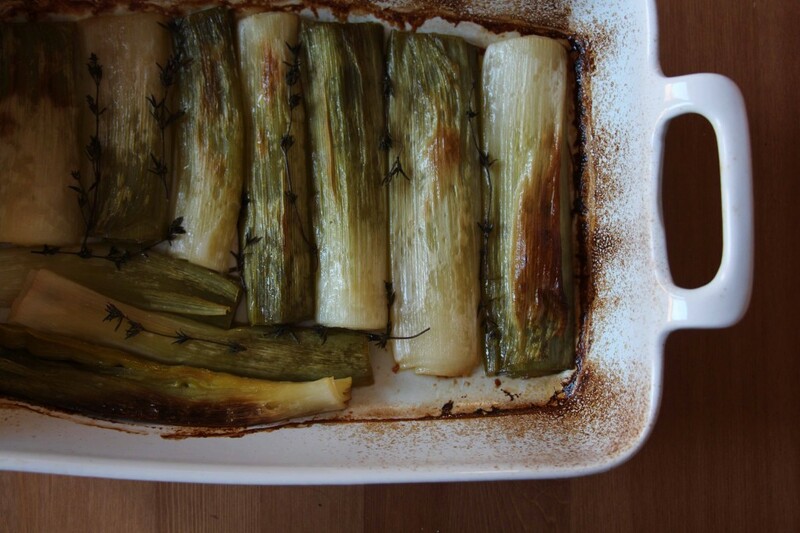 Braise the leeks in the oven until completely tender and easy to pierce with a fork, about 45 minutes. Uncover the dish and continue to braise until the leeks are caramelized, about 15 minutes more. Remove the thyme sprigs and serve the leeks warm or at room temperature. The Child does not eat meat, which isn’t really a problem – although I do love a good steak here and there. Mostly, I solve this by cooking steak on the grill, alongside a piece of salmon for her, or else we eat out and just each get what we like. This past week, I found out about a grass-fed beef lecture and tasting, sponsored by the renowned Seattle chef Tom Douglas. Normally, I’d drag The Child with me, but in this case, there was no chance she’d do anything but be miserable for the event, or even try to persuade a few other attendees of how wrong they were to be there. So I went with plan B: I found a friend to go with me to the lecture, and here’s a tip – if you ever get the chance to be the first person to give someone grass-fed beef, do it. The look of awe and amazement as they taste it and immediately discern the improvement is priceless. The Child stayed home alone, and such was my guilt over this that I made her favorite dinner and left it out for her. We eat a certain amount of pasta and pizza, and tons of bean burritos, since she’s still not a terribly adventurous eater – the challenge of course being that I am, and get bored with the repetition. But, I have found a few dishes that we both like enough to serve over and over. Mark Bittman’s Boulangerie Beans, from his comprehensive How to Cook Everything Vegetarian , is one of them. I make it once a week, because it is simple, filling, and nutritious. The long, slow bake results in beans and potatoes that are soft and richly flavored from broth and leeks; the potatoes layered on top also have a savory, slightly chewy skin that forms and adds some texture, along with the leeks. It takes only about 15 minutes to toss together, but it’s not a last-minute dinner due to the lengthy cooking time. That said, it can easily be made ahead of time and rewarmed when you are ready to serve. This was how I left them for The Child when I headed out for the grass-fed beef tasting. When I got home, there was enough left in the casserole for me to have one small bowl of it. In theory, the dish serves four as a main course; it could probably serve six as a side dish. But if you have a hungry child, it serves one. Heat the oven to 325°F. Saute the leeks in 1 tbsp butter, about 20 minutes, until very soft. Stir a teaspoon of the thyme, and salt and pepper to taste into the beans. Spread the beans into the bottom of a large baking dish and set aside. Spread the cooked leeks on top of the beans. Halve the potatoes lengthwise and slice thinly into half-circles. Lay the potatoes in overlapping rows to cover the beans. Pour the stock over the top, dot with pieces of butter, and sprinkle with salt, pepper, and the remaining thyme. Cover with foil and bake for 45 minutes. Remove the foil and continue baking until the top is browned and glazed, another 45 minutes or so. Serve immediately or let rest for up to an hour and serve at room temperature. Be careful how much salt you add to the beans if you are not using low-salt broth. The broth reduces during the long slow bake and you can end up with a very salty dish if using regular canned stock. This is my contribution to Weekend Cooking, hosted by Beth Fish Reads. 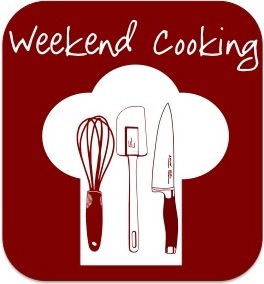 Why not swing by and see what other home-cooked goodness awaits?